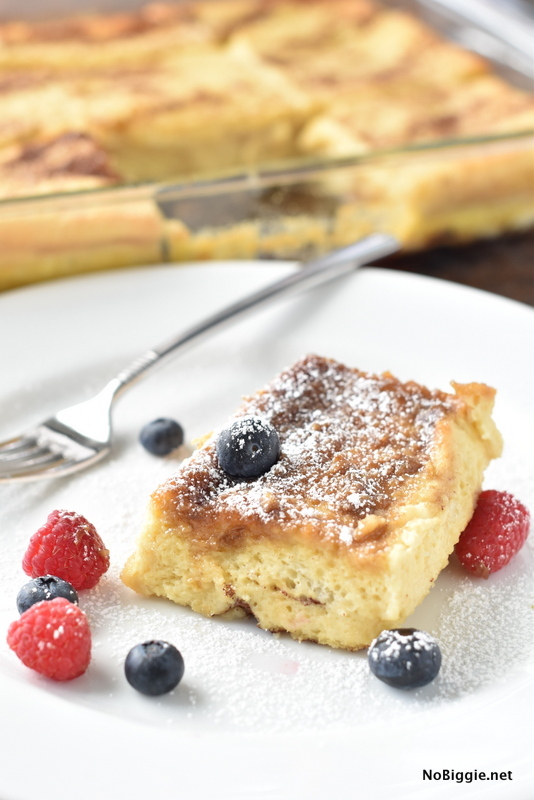 Overnight French Toast Bake – together, these are the four most delicious words! 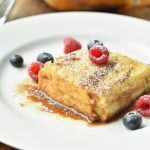 We’re big time breakfast fans at our house, and this decadent overnight french toast bake is worth waking up for. 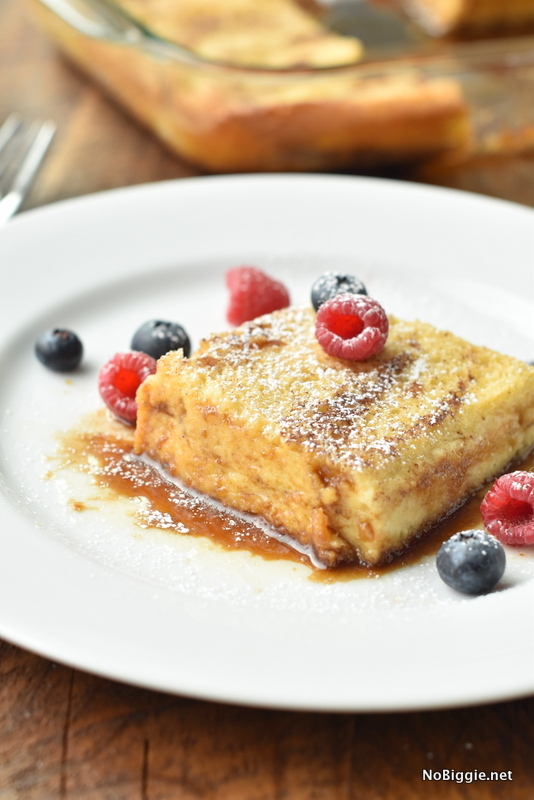 It’s basically baked in it’s delicious syrup, so no extra syrup needed. The top is crusty, the middle is soft and moist, & the bottom is the best part! You can serve it upside down…and let the sweetness soak in from the top down. We made a quick video so you can see how easy it comes together. You’ll have to make it this weekend! See all that syrupy goodness on the bottom?! It’s basically a butter brown sugar mixture that soaks into the bread. Here’s a view of it served upside down. The butter brown sugar mixture on the bottom soaks in and it’s so good! I can’t wait to make it again! In a glass bowl melt the butter in microwave. Stir the brown sugar into the melted butter until well combined. Pour the butter brown sugar mixture into the bottom of 9 x 13 pan and spread around. In a new bowl, beat together the eggs, milk, heavy cream and vanilla. 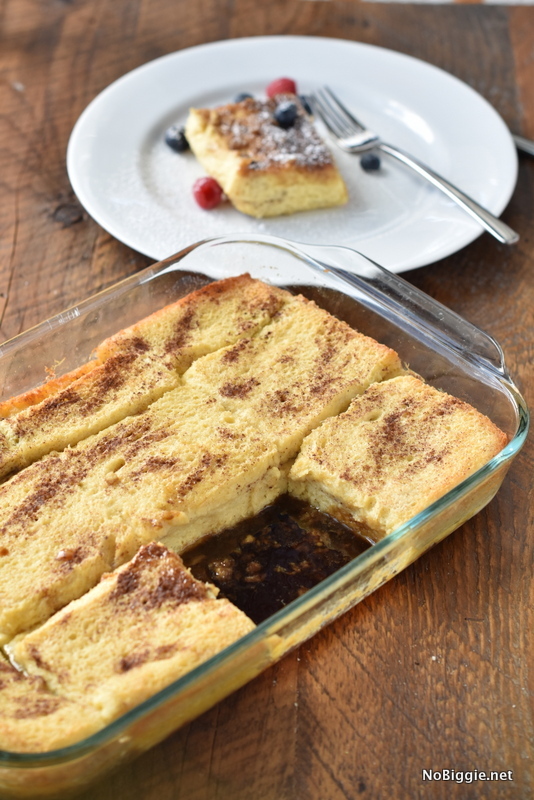 Lay a single layer of the white bread into the baking dish on top of the butter brown sugar mixture. Spoon 1/2 of the egg milk mixture onto the bread layer. Sprinkle this first layer with cinnamon. Add the second layer of white bread onto the first layer. Spoon the remaining half of the egg mixture over the bread allowing it all to soak into the bread. Sprinkle with cinnamon. Cover baking dish with plastic wrap and move to the fridge to chill overnight. Remove plastic wrap and cover with tin foil for baking. Bake for 45 minutes covered with tin foil for the first 30 minutes. Remove cover for the final cooking minutes. Before serving, sprinkle with powdered sugar. 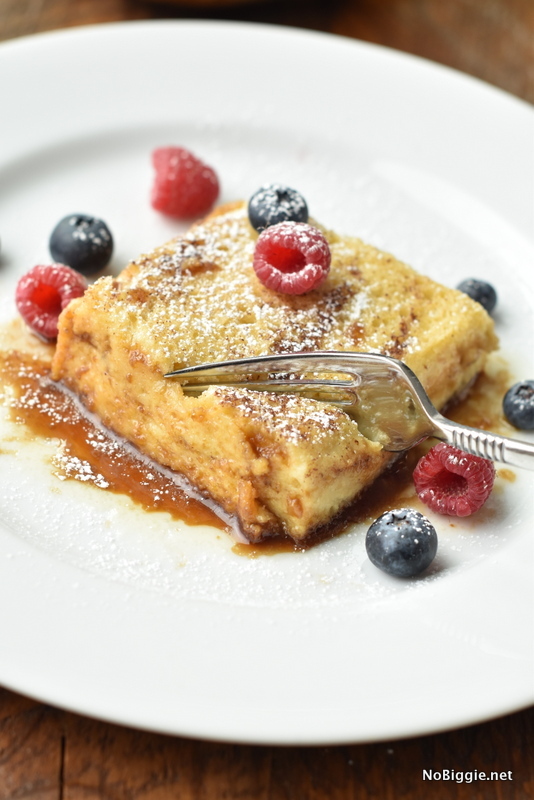 Next time you serve a special breakfast, you have to make this! What’s your favorite breakfast to make when you have the time?